The delivery of milk in Appleby by pony and float from the surrounding farms was gradually superseded by bottled milk being brought by vans from regular firms. Many of these changes took place after the war was over. There were two or three farmers who spent their mornings driving their floats round Appleby. One of them was Mr. Lewis Clamp, who lived in the farm behind the grammar school. He set off at 7am having milked his cows, did his round and returned home at about 1pm to carry on with his many other duties, such as haymaking. Mr. Clamp would arrive at a house and be greeted at the door by a villager bearing a jug. Into this was poured milk from a pail, using pint and half pint measures. This milk seemed richer than that which we drink today. Another farmer, who delivered milk, lived in a large Georgian farm whose fields covered the area now occupied by St. Michael's Drive and Hillside. These two men would sometimes meet, halt their ponies and indulge in a long chat. Up until after the 2nd World War and opposite to what is now McDonalds on the A444, stood an A.A. Box, attended by a smart officer in khaki uniform. When not out on duty he tended a tiny garden by the box. The picturesque but less efficient methods of farming gradually became mechanised - again after W.W.II. 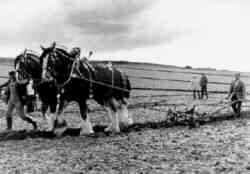 For many years the tractor could be seen in one Appleby field while in another the same task was performed by shire horses pulling the plough or binder. A farmer on a reasonably sized farm might have two men working permanently for him. Sometimes they lived at the farm. His son would also make up the team. At certain times of the year, though, more help would be needed. Perhaps six extra men and women would be engaged to help with the haymaking. for instance. They would turn the hay with pitchforks so that it dried out. When this was done the hay was loaded on to wagons and taken to the rick-yard near the house. The best part was when refreshments were brought to the field in large baskets. This consisted of tin cans of sweet tea and piles of cake and sandwiches.